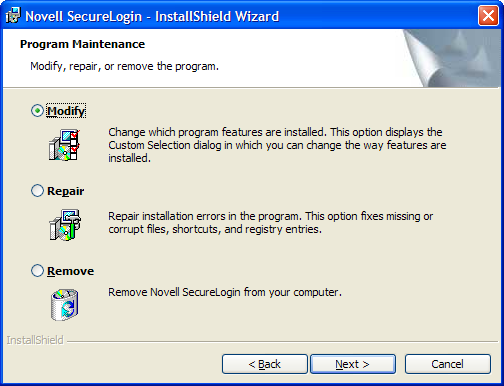 If you have Novell SecureLogin already installed, the InstallShield detects the installation and offers you several options for changing the existing configuration. Use the Modify operation to uninstall features installed during installation. However, you cannot change the options that are not listed. For example, you cannot use Modify to change the platform. Use the Repair operation if you want to install any missing components. The installation program detects the previously installed components and re-installs them. Use the Remove operation if you want to uninstall Novell SecureLogin and do a fresh install. For example, you previously installed an evaluation version of Novell SecureLogin in the standalone mode. After a successful evaluation, you now want to install Novell SecureLogin throughout your organization, which is using eDirectory. However, you cannot directly migrate from standalone mode to eDirectory. You need to select Remove, uninstall Novell SecureLogin 6.1, restart your workstation (if you are prompted to restart), then reinstall Novell SecureLogin 6.1.